Many books for children are entertaining, but some go beyond pure entertainment and use a riveting platform to reach out with a purpose. The intent of these books is to deliver a message, to speak, to teach. Let’s Change That! If Animals Can, We Can, Too! is a book that entertains with a wonderful message! While this book is geared toward K-3rd graders, younger children would find it entertaining and older children, perhaps even adults, would benefit from the life lessons, too. Using adorable, loving animals, Let’s Change That! If Animals Can, We Can, Too! teaches tolerance, acceptance, team work and overcoming fears. The book is entertaining, the characters easy to love and identify with, and the topics, though complex, are quite easy to understand and relate to. The story line is very well told and the illustrations are equally well done. The colorful pages draw the child’s attention and help them feel as if they are part of the story. 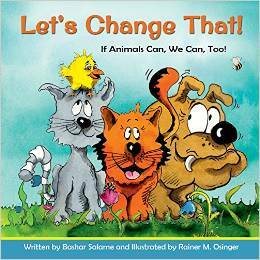 Using animals is a technique that seems to work well for reaching children and the author is able to make each animal seem quite human. This is a story that children will want read over and over; it’s likely you’ll memorize the lines before your child tires of it! But with its entertainment and strong life lessons, this book is a welcome diversion from the purely for fun books often chosen.